In AFL terminology 6 goals is a bag, 10 goals is feast whilst 13 goals is a mountain of goals. 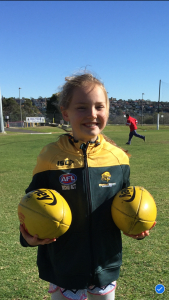 Charlotte (daughter of the WMS U14:1 Coach Craig) is thrilled to be part of a great team whilst Craig will be looking to improve Charlottes goal kicking accuracy on the training track this week. Well done Charlotte & great work team U10YG. 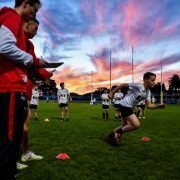 The QBE Sydney Swans Academy is holding Open Athlete Assessment Trials for boys aged 10 – 12 years. The assessment will involve a range of skill and motor competency tests, with each player receiving an individual feedback report following the assessment. Registrations will open in August, 2018. The training will be between 5.15 pm-6.30pm at Castle Cove Oval Holly St please advise your team manager if you would like to attend these training sessions.